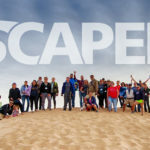 On March 8, 2015, Xscapers was announced to the public in Tucson, Arizona during the 55th Escapade. 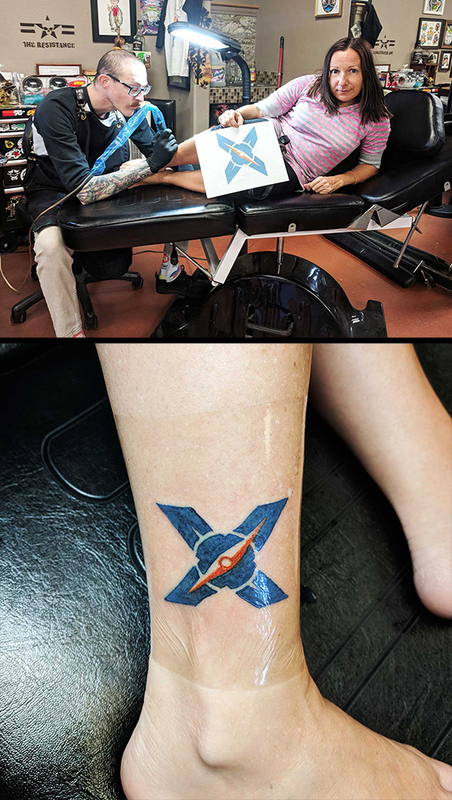 In celebration of the launch and their emotional tie with creating Xscapers, Travis and Melanie went to a local tattoo shop in Tucson to get the logo put into ink. The tattoo represents a combination of their joy, dedication, accomplishment and pride in a group they could call their own. While they had high expectations that this new group within Escapees RV Club would answer the need for community among the next generation of RVers, they had no idea how deep the impact would be. Nor did they expect that their tattoos would lead to any significance beyond themselves. An official announcement had to be made. 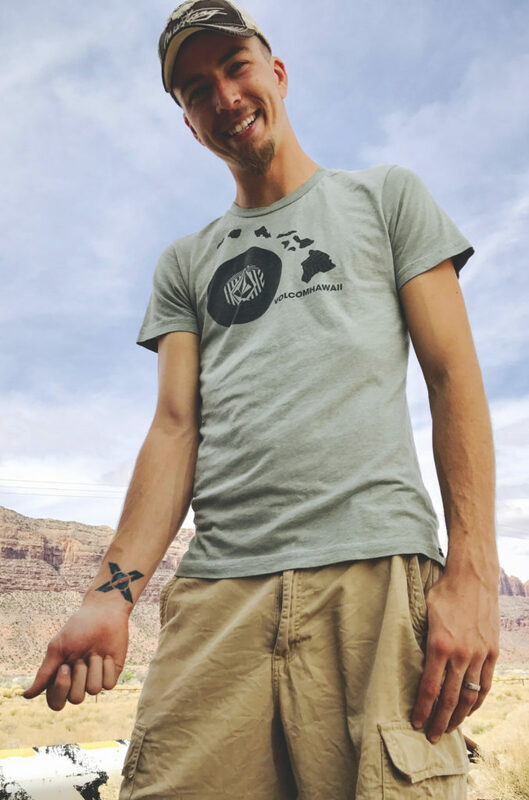 The first 10 people to get the X logo tattooed in color, 2 inches in diameter, and in a visible location while wearing a t-shirt or shorts became the guidelines of what was once just some campfire conversation. “Thinking it would take years for us to reach the 10 person limit, we once again underestimated Xscapers and the power of its community. Much like how we never anticipated it would grow to over 8,000 members in under 3 short years,” said Melanie. Scott Pleasants was the first to take up the challenge thrown down by Travis and Melanie. 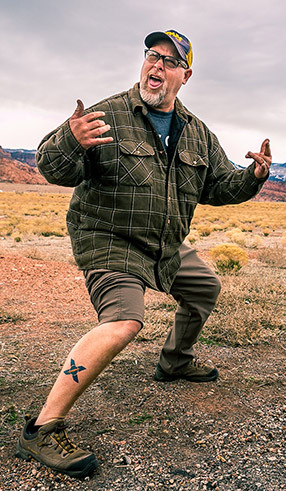 During the Moab Xscapers convergence, he arranged with a local tattoo artist to receive his tattoo. After the convergence ended, the party went on and others began to get their tattoos as well to show their appreciation for the great group of friends they found in Xscapers. What does Xscapers mean to you? We experienced our first convergence at the Albuquerque Balloon Fiesta in 2016. We didn’t know anyone in the Xscapers group and had no idea what to expect. From the minute we arrived, Travis and Melanie welcomed us with open arms, filled us in on all the events and invited us to join the group for happy hour. Wow, what a fantastic event it turned out to be! We immediately made connections with others, but we didn’t really realize we hit the jackpot with the Xscapers group until the following year at a small convergence in Kentucky. From there, we have enjoyed seeing the community grow and evolve at each gathering and truly look forward to seeing old friends and meeting new ones! We barely knew our neighbors when we lived in our sticks and bricks neighborhood. However, we have made so many great friends and we love meeting up and staying connected through social media. We really feel like we belong to a true community! Why did you get the Xscapers Tattoo? Once Travis gave the go ahead, I couldn’t wait to be the first person to get the Xscapers tattoo! I have several other tattoos and each represents a personal and significant milestone in my life. This new ink represents a new stage in my life. 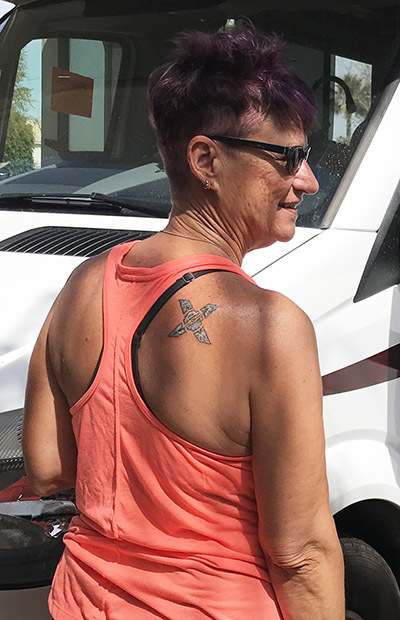 I am an X-er (with a little Boomer in me) and the compass portion of the logo represents our travels in many different directions. Last but not least, X marks the spot to a treasure. Xscapers has proven to be a treasure consisting of friends, new experiences, resources and adventures. It signifies freedom and is more than just a lifetime membership. My wife Carole and I have always been adventurers. We loved going on family vacations whether we were tent camping or just headed to the beach for a long weekend. I was a police lieutenant and retired after 25 years of service. During that time, I had seen many officers either retire and die shortly after, return to the job after a few years, or sit around their house growing old quicker. We loved going to the big RV show every year and started to dream about what retirement might look like for us. Once we started planning for retirement and after searching for the “right” RV, it took us awhile to put a plan in place. We knew we didn’t want an old RV, one we had to remodel, and we wanted a queen size bed. Long story short, we purchased a vintage 1973 Dodge Xplorer camper van that we had to refurbish, it was super old and had a teeny bed! We like to say that our old girl, Ripley, picked us! In 2015, we minimized our possessions, hit the road full-time and have never looked back! 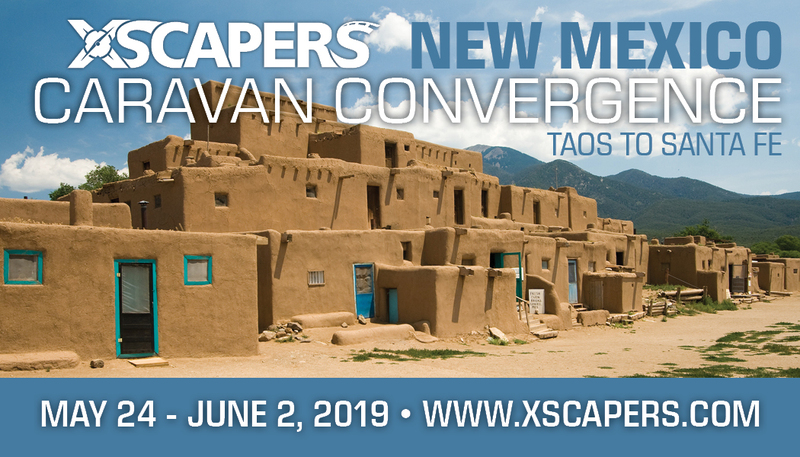 We’ve known about Xscapers for a couple years through various members who have vlogged about previous convergences and we knew that as working age RVers, we wanted to be part of it. Even having known about it, we didn’t expect that attending the Annual Bash would have had as much an impact on our lives in such a short time as it did. The experience has fundamentally changed how we want to RV going forward. While we expected to travel alone and see the country, we found that making friends on the road and experiencing the travels together is infinitely more rewarding. As we travel, we will forever be seeking out other Xscapers to meet up with them and explore this country together, be it for a few days or for months at a time. My wife Kathy and I decided we had had enough of doing the expected. While we raised our two daughters and sent them off to college and beyond, we just didn’t see the point of working just to pay for a house that we didn’t really need for just the two of us. We’re not near retirement age but my job in the software industry can be done remotely so we decided to sell the house and hit the road full-time. It took us over two years, but we made our dream come true and hit the road in November of 2017. My first year on the road, I was traveling by myself and oftentimes, it was pretty lonely. I had looked into various RV groups to try and meet people. Most of the membership of the groups I found was quite a bit older than me. I spent some time with a couple of groups and I enjoyed my time with them, but I was hoping to connect with people closer to my age with similar interests. I had heard about Xscapers and decided to attend the Annual Bash in Quartzsite, Arizona in January 2017. I had an amazing time in Q getting to know my fellow Xscapers, enjoying the activities, discussions, sharing of knowledge and skills, and of course socials gatherings. After the convergence I continued travelling with friends I had made there for several weeks. RV friends become fast friends and I connected with many of the people deeply. I continued to meet up with Xscapers I had met at Q along the road and keep in touch with my new friends via social media. Going to Q that year changed my life on the road. I went from being oftentimes lonely to having a network of traveling friends. I socialize more on the road than I did when I was in a sticks and bricks. I truly do not know if I would still be on the road if I had not met this group and became an Xscaper. 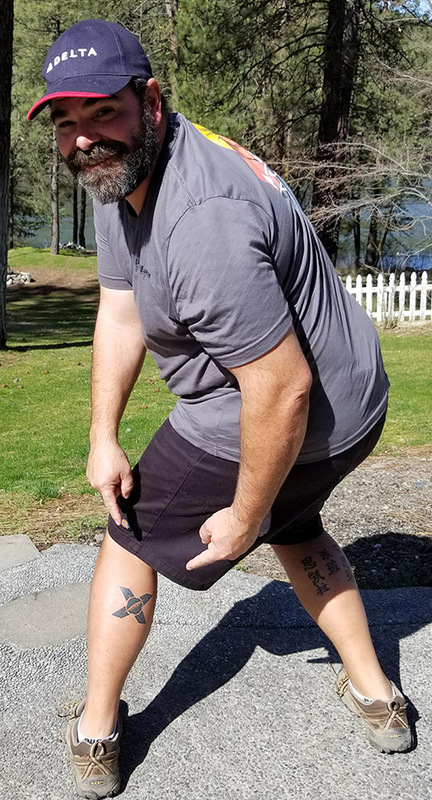 I decided there is no better way to show my connection, commitment, and pride in being an Xscaper than getting a tattoo. 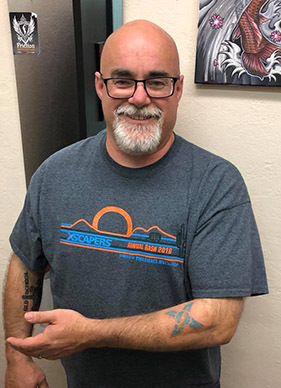 The challenge had been put out by Xscaper President, Travis Carr, at the 2018 Annual Bash and it got me considering getting the tattoo. 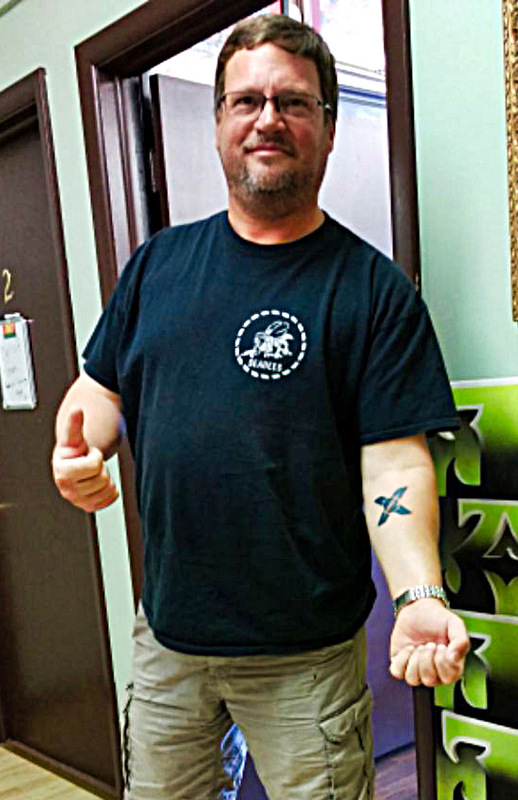 After three months (January thru March) traveling with old and new Xscaper friends, I decided to get the tattoo. I’ve been saying for a long time now that Xscapers are my friends, my family, my tribe. So I “got the X”. 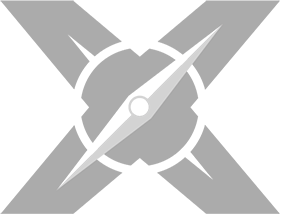 It’s a cool logo and Xscapers are an amazing group of people. I’m proud to be an Xscaper for life. I have always wanted to travel this beautiful country in an RV. I set my plan in motion several years before I retired so that I would be debt free. When I retired from the Air Force I had nothing keeping me from realizing that dream. I wasn’t tied to any particular location, my son was grown and had joined the Marines, and I’m single. I began downsizing and moved to stay with family for a while. I bought my first rig and hit the road in December 2015. My maiden voyage was from Missouri to California to visit my son who is stationed there. My original plan was 48 states in 48 months. That soon changed. My first six months were spent in California. I quickly realized I needed to slow down as the bulk of my money was being spent on fuel and I felt rushed when visiting places. I don’t work on the road. I have a modest retirement income and as I like to say, “I live frugal and free”. Up to this point most of my time on the road has been between the midwest and southwest. My future plans will take me to new locations as well as revisiting others where family and friends are. At this point I have no end date for being nomadic. When we finally sold our home we had a decision to make. We knew we were heading southwest to escape any chance of cold and knew inevitably we’d make it to Quartzite at some point. I reached out to an acquaintance (Stacey Quimby) and asked for her input on the Xscapers group. Her simple response of “it’ll be the best thing that happened to your RV social life” was all I needed to hear. In Quartzite, we had reservations because we’ve never really fit in with larger groups of people like this. 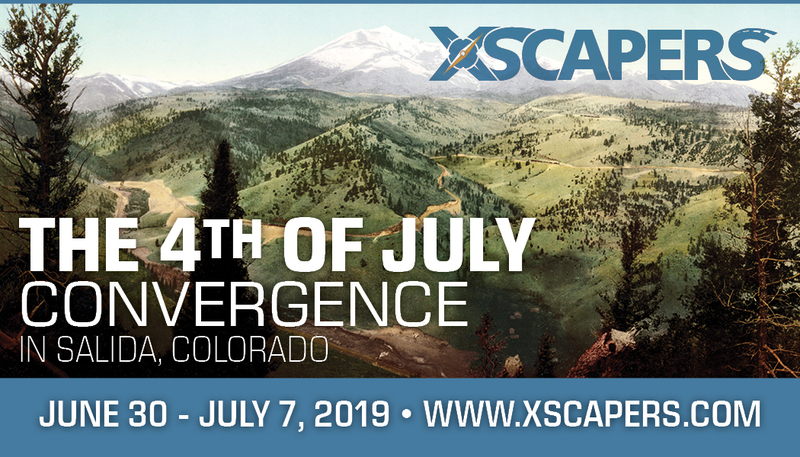 We hadn’t planned to continue on to other convergences, but after that first week, the following 3 months we spent less than 5 days without another Xscaper by our side! I have no other way to describe the feeling I get other than belonging. I’ve never felt like I’ve belonged somewhere as much as I belong with fellow Xscapers! Even if our future changes this will always be our tribe! When my daughter was born, I was working 50+ hours a week trying to pay all our bills. We were in debt and thought that was what we needed to do. Then I started researching ways to cheapen things up, looking at tiny homes, and ultimately RVs as a viable way of life. After literally exhausting my google search of different blogs I had made up my mind. This life means freedom from finances and freedom to roam! My wife and I first came across the Xscapers RV club during our research of full-time RV living. 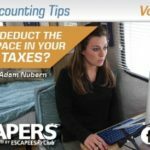 As we started our new full-time RV life, we had dealings with more people who were Xscapers and talked very highly of it. We saw that there was going to be a convergence in Quartzsite in Jan 2018 and decided that we would try to plan our travels to get them to align with being able to get there. Fast forward to the day we arrived, we signed in at the registration table and automatically knew we had made the right decision. We were greeted with open arms by everyone that we had dealings with, and the social gatherings brought many new friends together. There was no competition or judgment, just a bunch of people willing to lend a hand to anyone that needed some assistance. If you needed your own time to work or recharge, it was also strongly encouraged and deeply supported. On group outings, there was always someone offering an empty seat or coordinating to get people rides. No one was left behind. It was definitely a group that would stick together and watch each others backs if the need would arise. When the Bash was over, it was hard to say goodbye. But with all the new friendships we knew it would not be long before we would be in each others company again. In the end, it all came down to being a member of the Tribe. The day I decided to get the tattoo, I actually decided to get two. On one arm I put our Opting Out of Normal logo to represent the way I have decided to live my life. I don’t need to follow the old American dream of the perfect house with a white picket fence or the three cars in the driveway. On my other arm, I chose to put the Xscapers logo because it represents the family that I have gained through becoming an active participant in this community. The acceptance and love that we have received by our fellow Xscapers has been nothing short of amazing. It has not mattered how young or old someone is, what they do for a living, or how they choose to participate in this nomadic lifestyle, the group has always been 100% accepting. The bonds we have made are permanent. I see that tattoos as a sign of my commitment to both my choices. In 2010, I retired after 20 years of service in the Navy as a Seabee. My wife and I settled down in what we believed to be our forever home. Four years later, our daughter graduated high school and was accepted to West Virginia University under the Forensic Science program and we were 3/4 of the way through a long list of projects to our home, trying to make it our perfect castle. We became empty nesters and so began the daily repetitive grind. Go to work, come home, argue about what was for dinner and who was less tired to cook it, relax for an hour in front of the news, then go to bed only to wake up and do it all over again the next day. Our weekends were filled with lawn care and laundry and running errands so that we could be ready for Monday. After our daughter came home from college for the summer, we left her to take care of the house and our pets for 10 days and we were able to take our first vacation in 24 years with just the two of us. It was a trip in our RV visiting Watkins Glen and Letchworth State Park in New York and the PA Grand Canyon. We realized on that trip that we were certainly missing a lot of life being stuck in our rut of 2 full time careers and owning a house filled with stuff. We no longer had to provide for anyone but ourselves and we began the discussion on the importance to us of owning our own home. While we were having that discussion we were notified that our rental property tenants of 2 1/2 years were also giving notice because they were having their own house built. So within a few weeks we decided that we were going to list both properties and move full time in to the RV. And since we would not have a mortgage to pay we did not need to continue our full time jobs. We were able to pay off all of our debts, tuck away a decent security account, and start the adventure of finding out how to live. I think I happened upon Xscapers accidentally when checking out the possibilities of working on the road. I didn’t hesitate to sign up, I have already stepped so far outside of myself, why not join?! When I got to the Quartzsite annual bash, I parked way out by myself. By the end, I was right in the middle of the action in the solo area. I didn’t have any high expectations, just thought I might learn a few things. My expectations were blown away, I was very surprised to form bonds that felt like family. These people were active mentally and physically and that’s who I gravitate towards. I received the unexpected and will be forever grateful. I have no idea where I would be had I not joined this group, I think not nearly as happy and much more lonely. To me the tattoo is representative of the new rest of my life, a reminder that I can conquer fear and live, experience, breathe and maybe even create something AND there are people of like mind called Xscapers. After being widowed for 2 years, working at a job that caused stress that was very unhealthy and trying to be happy alone in the home I spent nearly my entire adult life in, raised my kids in; I decided it was time to start living and doing. In September 2017, I started looking at van conversions and following some full-timer blogs. In October, I bought a brand new class C, hired an estate sale company, then sold my home. I did short, dry runs at state and county parks before heading to Quartzsite in January. For the first couple of years of our RVing life, we were always alone and never found a “community” we could connect with until we went to our first convergence in the mountains of Southern Colorado in 2016. We met some amazing people at that first Xscapers event with whom we still are in contact with today. They encouraged us to stay out longer on that trip and attend more events and that is when our part-time full time living on the road began. It is also where we got this crazy idea to RV to Alaska and host an epic Xscapers Convergence in the land of the midnight sun and become Xscapers Emissaries. This past winter we weren’t even supposed to go to the desert, but the lure of our Xscapers tribe called us back out on the road and we headed to our second Annual Bash in Quartzsite where we learned that we had tied for the most Convergences attended to date by all those in attendance (5 Convergences so far). Over the past two years through the Xscapers RV Club, we have formed life-long relationships stronger than some of our own family bonds. Being an Xscaper gives us an opportunity to be with family, community and socialize on the road. It changed our life for the better and we wouldn’t trade it for the world. This tattoo means much more than just a corporate logo. It’s more than a lifetime membership into a club, it’s our way of life. This tattoo represents my lifetime commitment to our tribe. Being not only an Xscapers member, but an Xscapers Emissary, it seemed like a perfect fit for me to become a lifetime member. I am equally proud to say that up to this point, I personally know each Lifetime Member which makes it even more special. When we started this journey 5 years ago, we had no idea what to expect and how our lives would change, but with the Xscapers influence it has permanently changed our lives for the better and has introduced us to an amazing community and opportunities while on the road. Our travel name pretty much says it all “Pau Hana”, which translates to Done with Work, Quitting Time or Happy Hour in Hawaiian. We are fortunate enough to say we are semi-retired in our 40’s and we LOVE to travel. Prior to retirement, I worked for the airlines so we were able to travel anywhere in the world my airline flew. Now that we are stuck to land and sea we have taken our love of travel on the road in our 38ft Class A motorhome. We are what you would call part-time full-timers. We still own a sticks and bricks home but are out on the road 8 to 10 months out of the year. We have traveled all throughout the Southwest, visited all of the Western United States, made our way to Florida and followed the Gulf Coast west through Texas to California. In May 2017, we left home and traveled through Western Canada to Alaska. We spent 4 months exploring the beauty of the Canadian Rockies, Yukon Territory, Northwest Territory and almost every road in Alaska. 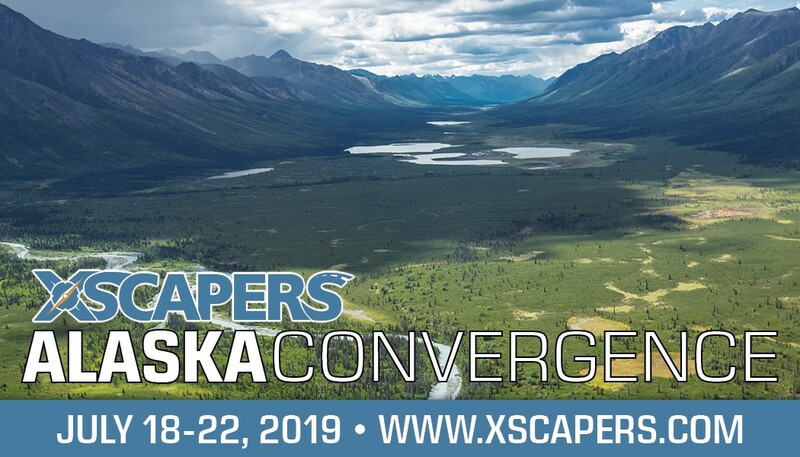 We loved visiting the Last Frontier and will be returning to Alaska in 2019 with other RVing friends to take in even more beauty and host our second Alaskan Xscapers Convergence. I love full-timing, but it’s been way more fun since I belong and attend Xscapers events. It has changed my life. Xscapers is my tribe. The tribe that makes feel the most me. They understand me, my lifestyle and don’t think I’m crazy when I tell them I live in an RV. I have been a member since 2016 and first attended the Annual Quartzite Convergence. I met other solos (and couples), that I am still friends with today. We meet, we talk and support each other. I love how fast I can build deep connections and friendships with the people I meet. We are all coming from different walks of life but this way of thinking, the minimalist mentality is a huge part of our lives so we become friends quicker. Talking with an Xscaper for a half hour is like knowing them for a long time. It’s friends; it’s a community. These are people who think alike, who think freedom and our time is our most important asset. Each tattoo should have its own meaning to the person who bears it. When it comes to tattoos, finding inspiration is everything. I never had anything that I wanted to put on my body and have it displayed there forever. Honestly, it has never really crossed my mind to have any tattoos. This is my first one and probably the only one… (Never say never though). I saw my friend Shane did it and I thought to myself, what a great idea! Having this tattoo represents a community, a tribe, friendships, mentality, freedom and a way of living to me. 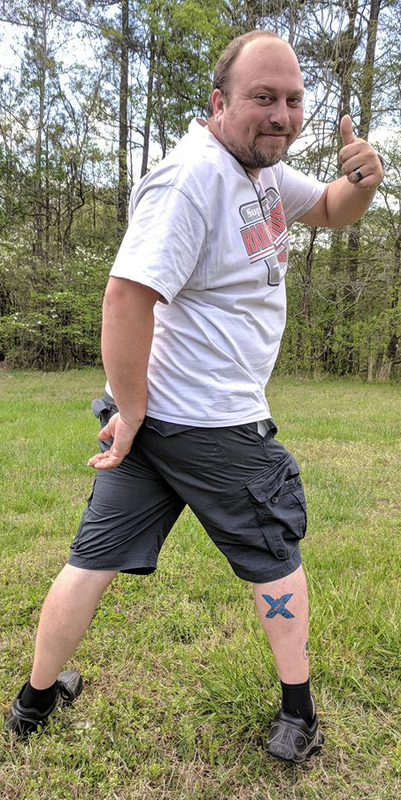 When someone asks about my tattoo I can tell them a story, it’s a great conversation starter; I can proudly talk about how Xscapers changed my life. After thinking about it for a week or two, I knew that I wanted to do it. So, I decided to go for it. I always loved road trips, discovering new places, and being on the road. I’ve seen gorgeous beaches and beautiful parks, but there is so much more I wanted to see. I’ve dreamed of living a nomadic lifestyle, working remotely, buying an RV and hitting the road with no particular destination and no specific timetable. Instead of living a life tied down to a 9-5 job, expensive rent and debt, I wanted to be free. After thinking it over, I decided it was time to make my dream a reality. After all, with no family in this country, I’m not tied down to any particular spot and in an RV I can actually feel at home anywhere I go. As an added bonus, I work in the internet marketing field, which gives me the opportunity to do most of my work remotely. Sure, most people wait until they are older and retired to make a big change in their life, but I wanted to do it now, while I was younger and able to enjoy it. It’s an idea I couldn’t get out of my head. After all, who knows what will happen in the distant future? Life is too short. The very night my wife and I had the discussion of becoming full-timers, one of the very first things we did was join Xscapers. The whole community has been full of valuable information and filled with like-minded individuals. When we are on the road and we meet working couples or individuals that are full-time, chances are that they Xscapers, too, and most of the time they are. By knowing there are so many of us out there, it makes the whole RVing thing a little less scary. People are doing the same things we are and experiencing similar problems. The best part of the Xscapers community is you are never really alone on the road. So when you feel a little homesick or lonely there always seems to be a fellow Xscaper nearby. To me Xscapers means family. As I said earlier, one of the first things we did even before making the decision to go full-time was join Xscapers. We recently attended our first Xscapers convergence in New Braunfels, TX. We were as I called us, convirgins. Mostly because of work schedules and partially because of my aversion to crowds. 5 years ago I suffered a brain injury and now have a stutter as a result of my injury as well as a permanent disability. Literally everywhere I go, there seems to be someone that makes fun of my stutter, whether it’s at a restaurant or out with friends and their friends. Even though this was a smaller convergence, it is always a concern of mine going into something new, especially when alcohol is involved. This was the first time I have gone to a larger gathering and not had any issues. Everyone welcomed me with open arms and free of judgment. They accepted me for who I am, what I am, and where I’m from. They really made me feel like part of the family. Tiffany (my wife) and I had been talking about me getting the tattoo someday in the future. Meeting everyone and spending some time with everyone solidified the decision for me to get what turned out to be the 10th tattoo. To me, the tattoo now represents a strong community and even more so a family. People that all have the wanderlust but yet still have the need to work. It represents a group of people that will literally do anything they can to help you in any situation. It is a strong group that I am happy to be a part of. We are originally from Minnesota and have always wanted to move someplace warmer. We went to an RV show with my in-laws to help them find a new RV for them to full-time in. As we were walking through, I found myself saying I could totally live in this one or in that one. After saying that 5 or 6 times, my wife said she could take a travel job in her field. I did not know that was an option for her. That night on the drive home we continued to discuss this lifestyle and did more research when we got home. We started out, like so many others with YouTube videos. Watched hours and hours of YouTube videos. I think we stayed up all night. The next day we contacted a realtor. He came out and gave us the numbers. We got our house ready and on the market in 2 weeks, and it sold in 2 days. We are now approaching our 1-year nomadiversary and I couldn’t be happier with our decision. The first 10 Xscapers with the X logo tattoo will receive a lifetime Escapees membership. The first 10 Xscapers have received their lifetime memberships, but that doesn’t mean the party is over! If you decide to get the tattoo, let us know so we can share your story too!